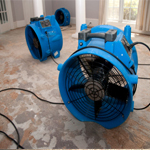 Prompt water removal and cleanup is essential in preventing additional damage to your property. Contact us as soon as possible to ensure a prompt cleanup. The sooner you get the water removed, the less likely mold will have an opportunity to invade your home. In addition, building materials will be less affected by water’s damaging effects. Emergency Board-up Services – If water is flooding into your home or business due to a broken window or hole in your roof, securing the property by boarding it up will lessen the damage. After all, without boarding up the gaping hole, more water will come in, causing additional flooding and more extensive damage. Keep in mind that these repairs are designed for the short term. An emergency roof repair is not necessarily a finished project. Once the storm moves on, call us to schedule a more thorough roof inspection and repair. Likewise, it’s unlikely that you’ll want to live with boards on your windows and doors. As a full service Houston contractor and water damage restoration service, we have the resources and craftsmen to install new windows and doors or repair your existing ones.